Walsh focused on education and jobs in the speech that was opened by a children’s orchestra a children’s choir. 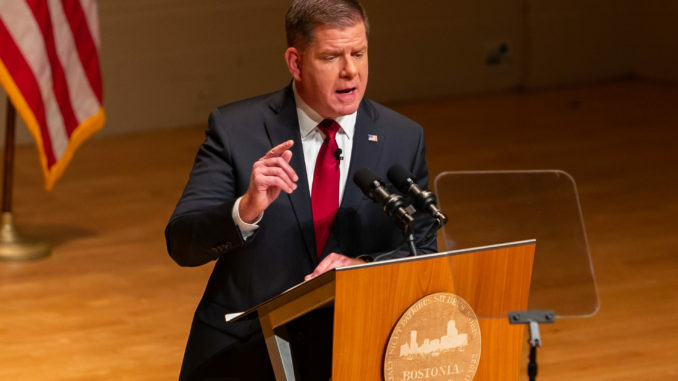 BOSTON — Boston Mayor Marty Walsh gave the State of the City Speech tonight at Symphony Hall in Boston. Walsh reviewed the city’s progress in jobs and education and outlined his administration’s agenda for the next year. What happens in Boston we feel on the streets of Boston, he said. “Today it’s a pivotal time in our country. Too many people in too many communities are being left behind. Yet instead of being called to unify we’re driven apart,” he said. “What we do in Boston can change this country,” he said. Walsh noted more people are working than at any time in the city’s history and that unemployment is at a low of 2.4 percent. “There’s no national infrastructure plan, none, but in Boston we’re rebuilding roads and bridges making our streets work for bikes and buses, and opening parks and libraries all across our city,” he said. The 54th mayor of the Hub was elected in 2014.